The American Academy of Cosmetic Dentistry (AACD) will host it’s annual Scientific Session this Spring from April 24-27, 2013. This year’s theme for the premier event in cosmetic dentistry is “Educate, Inspire, Connect,” which is perfectly aligned with our dental marketing goals for our dentists, their practices and their patients. 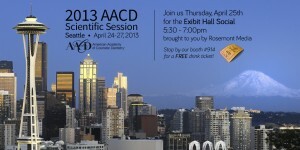 Our entire team of dental consultants will be at AACD 2013, which is being held in Seattle. You can find us at booth #914 in the Exhibit Hall, where we’ll be answering any and all questions concerning the latest in search marketing and dental website design. Our CEO Keith Humes is familiar with the Scientific Session, as he has been attending this event since 1999. He says he always looks forward to tradeshow season, as it provides a great chance to reconnect with clients and meet new ones. One aspect of the AACD 2013 Humes is especially excited about is the Social Hour that will be sponsored by Rosemont Media. The Social Hour will be held in the Exhibit Hall on Thursday April 25, 2013 from 5:30-7:00 pm. Humes says sponsoring this event is an important element of the AACD tradeshow this year because it allows him and his dental team the chance to slow down and spend some more quality time with those in attendance in a more relaxed environment. How Can We Help You Achieve Your Dental Marketing Goals? Because one of the main goals of the AACD 2013 meeting is to educate their member dentists, Humes urges anyone planning to attend the Scientific Session to come prepared with their online advertising questions. Whether they are curious about responsive website design, social media for dentists, or dental SEO, he says he and his team are always game for conversations concerning the effectiveness of each component, and the overarching desire to connect more often with current patients while reaching new ones. If you have questions and want answers ahead of the meeting, contact our dental marketing reps today, or visit our Facebook page and post a comment there.